Demystifying Pilates: Who is Pilates for and When is the best time to start Pilates? We have been running Clinical and Personalised Pilates since 2003. The easy answer to who is Pilates for and when is the best time to start Pilates is everyone and as soon as you can. Liz’s full body assessment reveals that she has a lumbar disc bulge as the major cause of her lower back pain. This is very common and the most typical cause of lower back pain. Liz has had disc related lower back pain for the last 5 years, on and off, but just coped with it, with occasional visits to the chiropractor. She has accepted her back pain as “normal” and that it will just happen every so often. Other findings include pelvic instability, which is due mainly to gluteal muscle weakness and slow activation of the gluteal muscles. Overall, Liz is very weak, she has very poor muscle tone and poor core stability. Liz started our 13 week Pilates program and on her first session, we assess her core stability on ultrasound, which determines her core stability as 3 out of 12. This means she struggles to take her leg out to the side and maintain core stability, very typical for pelvic instability. 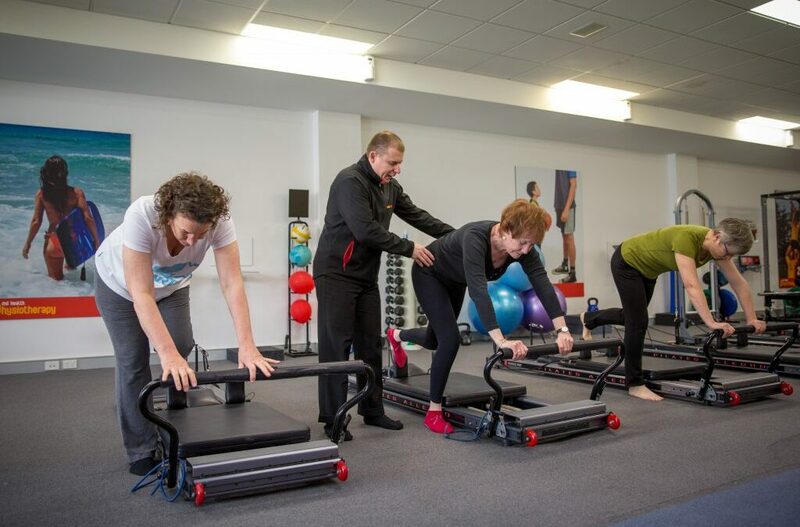 We start training her core stabilisers on the Pilates reformer, to make sure Liz walks away on the first day with a good idea of core stability. We also worked on improving gluteal activation and shoulder blade control to start to improve pelvic stability and upper body posture. We add a couple of treatments to start to manage the disc bulge. It seems to Liz, such as simple session, but she walks away feeling more tired than she expected for such simple exercises. On her second session, we begin where we left off, re-enforcing her core stability, especially where Liz struggles to control her core stability, taking the leg out to the side. We reinforce the gluteal and shoulder blade control exercises. We start to work on the other muscle groups as well. In addition, we work on reducing the lower back pain with McKenzie extension exercises to help minimise the lumbar disc bulge. Over the next few weeks, we continue to work on Liz’s buy tadalafil online overall muscle tone, with special focus on the core stabilisers and the gluteals to help manage the pelvic instability. Liz’s lower back pain has begun to fell a bit better, but flared up on the 5th week after doing work extra gardening on the weekend. Although the pain was present, it settled after 1 week, which is a bit faster than usual and it didn’t affect her as much as she expected. When we performed Liz’s re-assessment at week 7, there was a moderate improvement in Liz’s muscle tone and her core stability was now 7 out of 12 on both sides. Although the back pain was occasionally present, it seems that it doesn’t affect her as much as it used to. Liz has been surprised how her sessions have gotten harder over the last few weeks and sometimes she’s sore the next day, usually in the front of the thighs. The lumbar disc bulge signs are present on assessment, however not as prominent as on the initial assessment. Pelvic instability is also still present, however, gluteal activation has improved, however gluteal muscle strength is still not where we would like to see it. We modify Liz’s program. The back pain and pelvic instability are still a major focus of her program, but we can now push Liz a bit more during her sessions and be a bit tougher on her. Liz enjoys the challenge of the second 6 weeks of her program. She is pushed a lot more during her sessions, and the staff find new ways to make her exercise more challenging. Sometimes there is no muscle soreness the next day ( the good kind) and sometimes she struggles to walk up the stairs because her legs are so sore (Depends on how mean we decide to be on the day 🙂 ). When Liz has her 13 week re-assessment, she is substantially stronger and her core stability is very good (8 out of 12). Her back pain due to the disc bulge is minimal and barely affects her life. The pelvic instability is minimal, due to improved gluteal strength and activation. He overall muscle tone has nearly doubled and her life is different. She finds her everyday things to do are just easier, she can go shopping, look after the kids, do the house work, go to work and these tasks are not as much of a chore anymore.